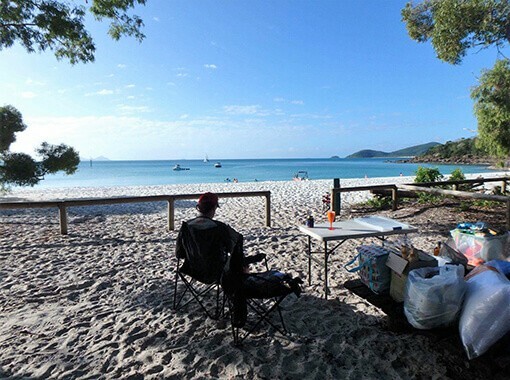 Why not try camping in the Whitsundays, on one of the many islands that cater for camping. Get back to nature, get back to basics, leave all the distractions of everyday life behind you and enjoy all that the Whitsundays has to offer. Sun, sand, swimming, fishing, snorkelling, relaxing, interacting with the abundant wildlife and marine life. There are many island campsites that you can choose from, around thirty three in total. Check out the link below. There are a set amount of people allocated to each campsite anywhere from six per campsite to thirty six. You will need to purchase a camping permit per person by phoning 137 468 or online www.npsr.qld.gov.au . Once you have booked and paid for your permit, they will issue you with a number and tent tag. Not all island sites can be accessed at all tides, So make sure you do your homework before booking. There are large tides here, you will need to look at the anchorages for tidal access. Some anchorages provide public moorings or the alternate would be to secure your boat by anchor. Always be well prepared, plenty of water and food, first aid kit, gas cooker and utensils, insect repellent, 50 plus sunblock, hat and reef walking shoes. Insect proof tent or swag and always keep the zippers closed at all times to save from any unwanted wildlife. All the islands are National Parks so open fires are prohibited. AIRLIE BOAT HIRE can offer a number of different sized boats to get you to the islands. All you need is a valid national or international boat license, our boats are the best way to transport you to your tropical island getaway. We can help with camping equipment as well. Imagine jumping on your own private boat, heading out to your own private island campsite, with the convenience of being able to relax on the island and take your hire boat on a different adventure every day in the amazing clear turquoise waters of the Whitsundays. 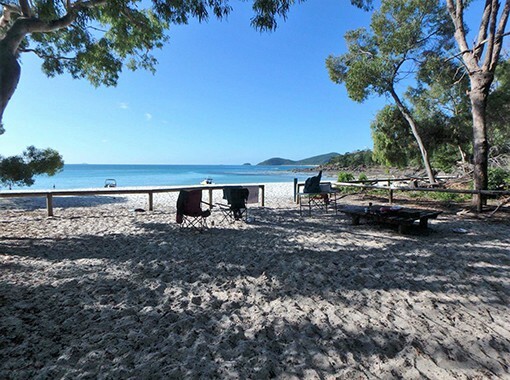 Check out our website www.airlieboathire.com.au where you will find all the information you need, plus pictures to give you a sneak peek of what you can expect with a camping holiday in the Whitsundays.